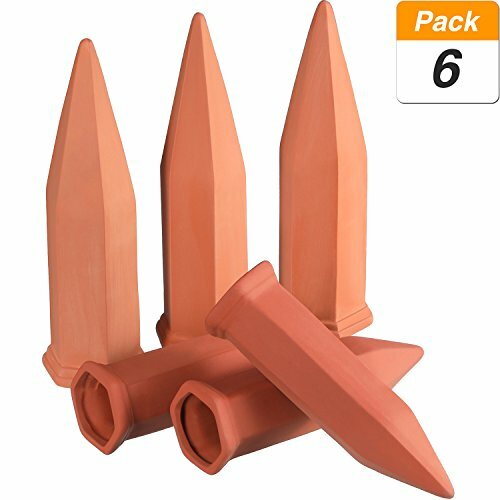 The modern innovations plant watering stakes are fashioned specifically to deliver just the right amount of water a plant needs. Use with wine bottles to make a water reservoir and insert it topped with a plant watering stake into moistened soil. As the soil loses moisture, it is replaced as a result of gravity and diffusion through the terracotta stake, replenishing plants so their roots grow deeper and use water more efficiently. The modern innovations plant watering stake system is an easy and green way to passively water household and home garden plants while promoting their overall health. Turn the bottle over carefully with the stake firmly on the top. Be careful not to squeeze too much, but keep the bottle opening covered so it doesn't overflow. Push the stake and bottle into the guide hole carefully till it's almost completely in the soil.